What to look for and why. So far, 2018 has been a fairly decent year for most of us southern beekeepers. Years of disappointing nectar flows, (due in part to water-starved or water-soaked landscapes), didn’t occur. This year, when the Spring rains did arrive, they stopped just as the bloom began to open, letting the sun shine in and the nectar flow. Assuming we were diligent beekeepers and took care of any issues throughout the Summer, our bees could be stronger than ever going into Winter and hence into the 2019 Spring nectar flow. But, if we haven’t prepared our colonies for Winter yet, it’s already late August, so we better get moving! This is the time to check our colonies for food, queen performance, disease and pest activity, and take care of any other issue as well. So grab those colony data sheets and let’s get cracking by checking each and every colony from top to bottom. Start by removing the lid and looking for small hive beetles (SHBs). Populations are higher than normal this year due to our warm Winter and moist Spring and Summer; therefore some colonies may have more than they can handle. 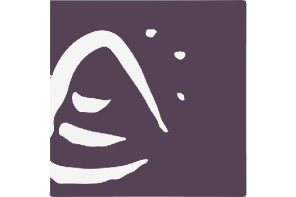 If you see these little black devils scurrying about, placing traps in your colony may be the way to go. 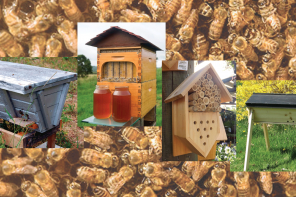 There are several on the market and available through the bee supply companies. We’ve tried them all and have had the best success with the Beetle Jail Baitable (plastic, two-chambered reservoir, with a center chamber to place bait which snaps onto a frame) and the Beetle Blaster (single chambered reservoir which rests between two frames). Both work by filling them with oil. The beetles scurry into them to hide from the bees and end up drowning in the oil. However, be careful when filling these traps to not fill them to the top. Only fill the reservoirs about half way, otherwise you may spill oil onto the bees when placing them into the hive and the oil will kill bees instantly. Since temperatures are still warm, beetles mainly keep to the outskirts of the hive, so place the traps where you see the most beetles. As temperatures begin to drop they will begin to migrate towards the cluster. But, for now, most SHBs can be found in the upper supers, hiding in the corners and in-between the frame parts. A word of caution; SHBs love frame spacers and plastic frames because they provide little pockets into which the beetles can hide and disappear. Another new strategy for dropping beetle populations, is a Brawny Dine-A-Max beetle towel. It’s basically a micro fiber, industrial paper towel, that the bees chew on, causing it to be turned into fluffy/fuzzy material. Once the towel has been transformed the spines on the beetle’s legs become entangled and ensnared in the fabric. After a few weeks, the fabric may be covered in beetles or not. Every colony is different. From my experience, if the bees heavily propolize the towels, then very few beetles get trapped, but if they don’t and “fluff” them up, then there are plenty of beetles caught within the threads. The next task is to assess the amount of honey stores. 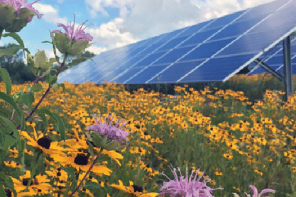 Depending on numerous factors, nectar flows can differ drastically from one apiary to the next. 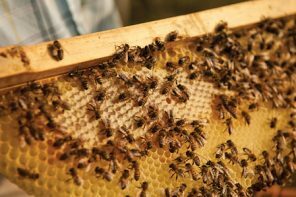 If flows were below par, or too much honey was taken for human consumption, feeding must become a priority. Once the temperature drops, it is difficult for the bees to break cluster to collect and store the food. All the syrup in the world will be useless if the bees can’t get to it. And think in terms of gallons when feeding. It has been my experience that five gallons of a 2:1 sugar solution (two parts sugar to one part water) will yield one full medium super (roughly 35 pounds). Depending on your neck of the woods, this may not be enough. If you are unsure of how much honey is required to get a colony through Winter in your region, consult an experienced beekeeper in your area. 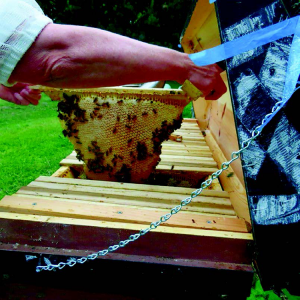 The further north bees are kept, the more honey is required to survive the Winter. The rule of thumb we go by this time of year and here in the Piedmont region of Georgia; for every frame of bees/brood, they will need a frame of capped honey. 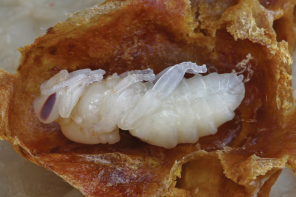 But depending on how the Winter shakes out, you may still need to feed during the critical months of January and February when the queen is laying eggs like crazy in anticipation of Spring. A word of caution; feeding this time of year can be tricky, so be careful not to trigger robbing (when bees from a neighboring colony/ies invade and steal most or all of the invadee’s honey). A single drop of sugar syrup clinging to the side of a colony or spilled at the entrance will attract attention, especially if nothing else is available. Once bees start robbing it becomes a feeding frenzy, with even strong colonies succumbing to the onslaught. That is why I don’t use top feeders, entrance feeders, or baggies. We use 2 – 5lb honey jars, so I’m feeding one gallon at a time. Also, if a colony is starving or in desperate need of food and the weather outside is chilly, I can put the food directly above the cluster so all the bees have to do is lift their heads and eat. Bees cannot, will not, break out of the cluster and traverse across cold surfaces in order to eat. They just can’t do it. 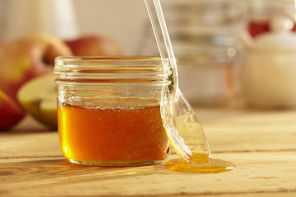 So another item for your check list is to make sure the honey is properly placed. Honey should be above and surrounding the sides of the cluster. Not to the bottom. 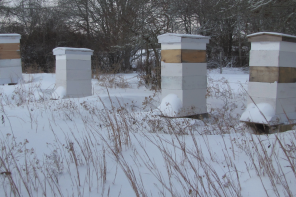 As Winter progresses, the bees move up and into the supers above. Next moving into the brood chamber, check the viability of the queen. How does her brood pattern look? Are there skipped/open cells? Do you see any supersedure cells? If the pattern is spotty and the colony population is weaker than most, you may want to look for other problems first, such as disease or mite infestation before automatically assuming there are queen issues. However, the queen could be old, poorly mated, injured, or not properly reared. If you determine that the queen is failing, and the colony is weak, your best bet is to combine the colony with a strong one or one needing a boost. 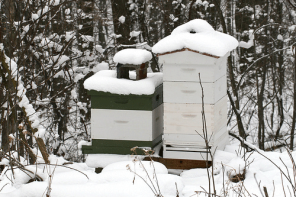 Weak colonies rarely survive the Winter, so there’s no sense in allowing the colony to limp along when you could have spared the bees and equipment from eventual disaster. Plus, re-queening this late in the game can be tricky, even if you could find a supply of queens. Goldenrod blooms in North Georgia during September and moves south, with the Piedmont region usually experiencing a pollen flow by early October. So far, there’s good ground moisture in place and plenty of sunshine, so the south should experience a decent bloom. In years past, drought prior to, or excessive rain during the bloom meant minimal amounts of late-season pollen. Since adequate amounts of pollen must be available to produce Winter bees (which we’ll explore in a minute), check the pollen supplies. If pollen stores are lacking you may not want to wait for the Fall pollen, just in case it doesn’t materialize. Pollen patties are simple and easy to install and can be purchased already mixed together or in powder form. You may want to try several to see which you prefer. Another word of caution: SHBs love pollen patties. If you are seeing SHBs, portion out the pollen patties in stages (a ¼ or ½ patty at a time) otherwise they remain in the hive too long and the beetles will oviposit into them creating a wiggling, disgusting, beetle larval mess. Next, examine the brood area for disease. You want to see healthy, white larva in the cells. Also, look for depressed cappings or ones with holes. Open these and inspect the pupae. Anything slightly off-color may be a sign of trouble (unless the pupa is in its later stage of development). 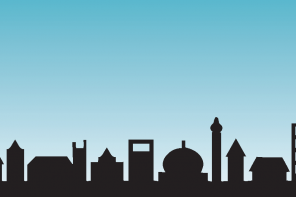 Again, if you are unsure about what may be ailing your colony, consult a professional for diagnosis and treatment options. Another chore before the Winter winds come a howling, is to inspect your equipment. Move frames with old comb to the outer edge so that they can be removed in the Spring and replaced with new foundation. 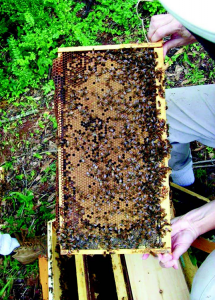 Old brood comb is a reservoir for numerous contaminants, which can be detrimental to the developing brood and should be removed every three years. 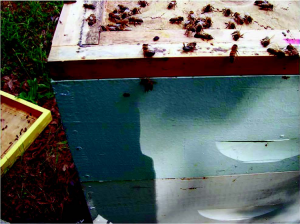 Replace old, decrepit hive bodies, supers, lids, inner covers and bottom boards with newer equipment. 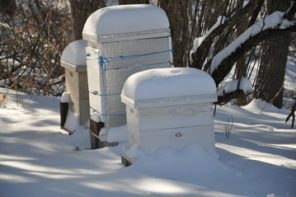 Beehives don’t have to be pristine little palaces; however, they do need to protect the bees from the upcoming frigid Winter weather. Gaping holes and cracks allow access for critters to come and go. Mice especially love to make their Winter homes in a beehive. A continual food supply, plus a warm cozy environment, make hives a suitable rodent dwelling. Structurally tight equipment and mouse guards discourage these unwanted guests. Queen issues, food supplies, disease, and bad equipment are all things that need to be addressed before the arctic air descends upon us. 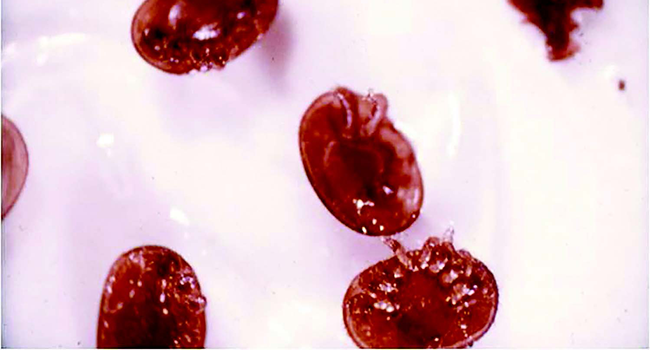 Yet, there is still one more thing that we must not overlook: Varroa mites. By the end of Summer, mite populations may be skyrocketing. Please don’t wait until your colonies are crashing. Once the downward spiral begins, it is almost impossible for them to recover. Check those mite populations today. 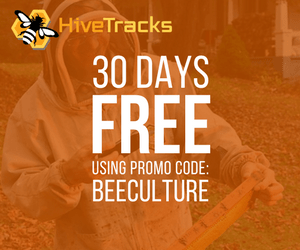 Not only is it important to get their numbers under control for the existing bees, but also for the future bees that will bring the colony into the New Year. I’ll get back to the importance of reducing mite populations, but first let’s talk about these future bees. 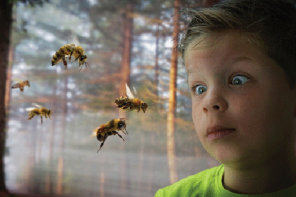 The average lifespan of honey bees varies considerably based on the season when they emerge. These variations have been designated into two groups of bees dubbed Summer bees and Winter bees. Summer bees live approximately one month, while Winter bees can live anywhere from six to eight months. Winter bees emerge will begin to emerge in August or September, depending on location, and differ from Summer bees by several physiological characteristics. Scientists have determined that the lifespan of honey bees can largely be determined by the amount of protein stored in the fat body, hemolymph, and hypopharyngeal glands. 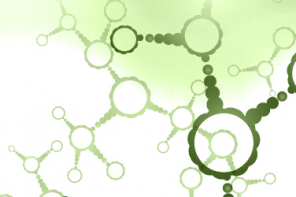 The most notable and scientifically relevant type of protein is the high-density glycolipoprotein vitellogenin. It is loosely described as a female-specific, hemolymph storage protein, or more specifically, an egg yolk protein precursor. 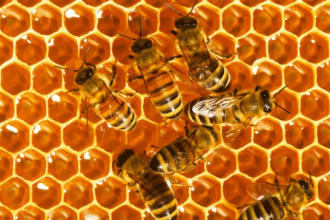 However, since worker bees rarely lay eggs, this protein is stored in fat bodies for future use. The relevance of this specific protein is largely based on its abundance in honey bee hemolymph as well as its high zinc concentration which regulates many functions within the honey bee. Vitellogenin is also thought to be a powerful anti-oxidant which significantly slows the effects of aging. Now, getting back to the importance of reducing mite populations. Higher mite populations going into Fall, (and the viruses associated with them), coincide with the production of these Winter bees. Research has shown that mite infestation during the pupal stage has a negative impact on the bees because they are unable to accumulate the necessary hemolymph proteins, including vitellogenin, to the same extent as in non-infested bees, thus reducing their ability to overwinter. 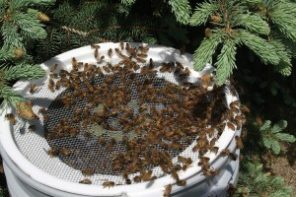 In order for the colony to have a chance of overwintering successfully, it is imperative to reduce mite levels before the production of these Winter bees. And to step back even further, the bees rearing the Winter bees need the proper nutrition and development as well. They must be healthy enough to rear the Winter bees, and the bees rearing those bees need to be healthy, and so on. 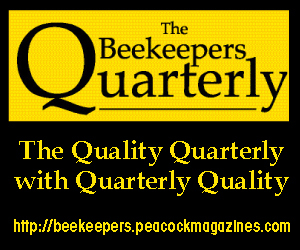 Managing mites is the most important and difficult task for beekeepers since it is the number one reason bees die. If mite loads are high or if you are new to beekeeping, we recommend that you treat immediately for mites, especially if you haven’t done so this year. We recommend several products for use this time of year, Api Life Var or Apiguard, both using essential oils as the active ingredient. There are temperature restrictions for this product, so follow all directions while using these or any products in your colonies. There are other miticides available, but we have the most experience using the ones with essential oils. Next issue, I will discuss our research results using oxalic acid and vegetable glycerin to combat mites. Re-queening, appraising honey and pollen stores, checking for mites and disease, inspecting equipment (while keeping robbing at bay) will help the colonies do what they want to do, survive! By storing honey for energy and pollen for protein, European bees have evolved to survive long Winters. But unfortunately, with introduced exotic parasites, diseases, viruses and a whole host of other non-indigenous species, “we” have thrown this whole process out of kilter. Now “we” the beekeeper must be better stewards of our bees or face the consequences of finding more and more of our hives devoid of life. Take care of you and your bees!